As a professional chef and former teacher, Chef Patricia Mulvey brings all her experience together to help you learn new skills in the kitchen. 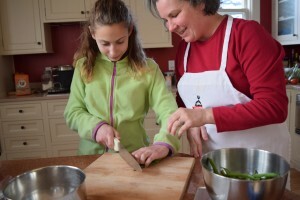 With in-home cooking classes offered through the greater Madison, WI area, students learn how to cook the foods they love to eat in a relaxing environment, using their own equipment. Students choose the date and time of their class, the menu they want to learn, and Chef Pat shows them the ropes. Chef Pat’s specialty is cooking through a CSA delivery and season, as well as Vegetable-Centric Cooking; but she is expert in many cuisines and types of cooking. We will meet to discuss what you want to learn and then make a plan to make it happen! Students will be sent a detailed shopping list prior to class so they will have the necessary groceries on hand. For an extra fee, I can do the grocery shopping for you. Please make sure your kitchen is clean and clutter-free before the start of class. We strive for a “clean-as-we-go” policy to keep the kitchen orderly during the lesson. Aside from any of the dinner dishes you’ll be eating from and any food vessels with leftovers, we will clean the kitchen prior to leaving.